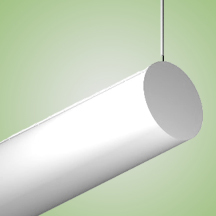 The EJ Indirect Luminaire is a classically styled fixture fit for any interior. They are designed to be pendant mounted via a rigid or cord pendant making them adaptable for a number of ceiling types and applications. The fixture is a indirect light fixture. The fixture is ideal for indirect general illumination with no glare and an aesthetically pleasing housing. Provided with a ribbed acrylic diffuser or baffle.